This entry was posted on April 22, 2014 by Jessica Anderson. At Trophies2Go, our goal is to create the perfect award for you to give to someone special. 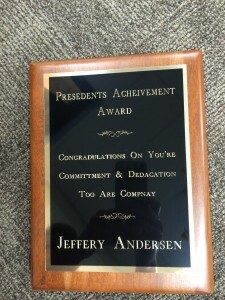 We take great pride in expertly etching a unique, personalized message on each award we create. We want the award you purchase to stand the test of time and be a cherished for years to come. 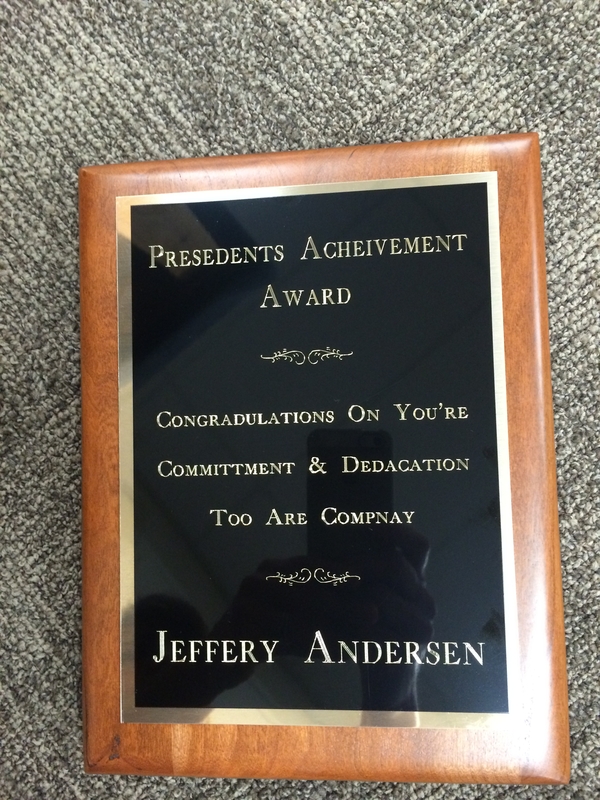 One obstacle we often see in creating a memorable award is engraving errors, especially MISSPELLED WORDS. We try our hardest to catch these offenders when they come through our website, but sometimes they get missed. Customers accidentally type the wrong information, or sometimes it’s our mistake – you call your order in, and there’s a typo, for example. With this blog post, I hope to point out common errors we see in the hopes that everyone, both our staff and customers, double and triple checks the engraving so that it’s error free when engraved onto the award. How many engraving errors can you find on this phony plaque? It was fabricated specifically for today's blog. If you have any of these words in the text of your award, use your spell check to make sure they are correct before submitting the engraving. 2. The Wrong Date. An order gets repeated from the previous year, yet last year’s date doesn’t get updated. When you get your order confirmation email, be sure to double and triple check the dates, especially the YEAR, to be sure the date on the award is correct. 3. Misspelled Names. Often we have to re-make awards because names are misspelled. To remedy this problem, it’s a good idea to confirm spelling before entering engraving information. For participation awards, double check your team roster with parents before submitting the engraving for your trophies. For corporate awards, double check the spelling of the winner’s name before placing your order. Our goal is to create a fun and hassle free ordering experience for our customers. But unfortunately mistakes do occasionally happen. When an award is incorrectly engraved, give our customer service team a call at 877-926-4700 to find a solution. To prevent errors, double and triple check the engraving text when placing your order. We strive to create accurate and beautiful awards to be enjoyed for years to come!